(Minghui.org) Many Falun Gong practitioners have filed lawsuits against Jiang Zemin, the former Chinese dictator who launched the persecution of Falun Gong 17 years ago. As they used their real names and addresses in their criminal complaints, they have been retaliated against for exercising their constitutional right to hold Jiang responsible for infringing upon their freedom of belief. In Qiancao Town, Sichuan Province, the authorities have deceived and threatened the local practitioners into signing documents that claimed they “repented” filing their lawsuit, that the lawsuit was false, or that they denounced Falun Gong. The authorities in Guangming Community called a practitioner to the community office. They convinced her that they needed to see her about compensation for her land. She unknowingly signed a statement saying that she “repented” practicing Falun Gong. The director of Jinsha Community told a practitioner to sign unknown documents and that, if she did, the harassments would stop. The practitioner and her family were not told what the documents said before or after signing them. Another practitioner from the same community was told to sign a statement. The document said, among other things, that she had been deceived into suing Jiang and that she had decided to sever ties with Falun Gong. The practitioner refused to cooperate. Besides deceiving practitioners, the Jinsha Community authorities tried to coerce the practitioners into signing the false statements in other ways. A practitioner was the sole caretaker for her husband who had cancer and her paralyzed daughter. The authorities threatened to put her away in a brainwashing center. The authorities threatened to fire a practitioner’s son who worked for the town government. The son had to force his mother into signing the documents. After the authorities frequently broke into a practitioner’s home and harassed her and her family, her son and daughter-in-law were terrified. They not only signed the documents against the practitioner’s will, but also prohibited her from meditating or leaving the house. Authorities in Ebaoshan Community threatened to revoke the local practitioners’ pensions if they refused to sign. They also ordered a practitioner and the family to turn in their personal identifications until the practitioner signed. Mr. Cheng Huaigen was charged with “using a cult to undermine law enforcement,” a standard pretext used by the Chinese communist regime to frame practitioners of Falun Gong, a spiritual discipline based on the principle of Truthfulness-Compassion-Forbearance. Mr. Cheng’s lawyer emphasized that there is no law in China that criminalizes Falun Gong; hence the persecution of the practice has been illegal from the onset. As such, his client broke no law by spreading the goodness of Falun Gong. Moreover, the lawyer pointed out, the banner caused no harm to anyone, let alone undermine law enforcement. Mr. Cheng also testified as to how Falun Gong cured his asthma. He explained that that is why he never shied away from telling people how good the practice is. During the June 10 trial, Mr. Cheng’s family noted that the once healthy man had been reduced to just skin and bones since his arrest about one year ago. They are extremely concerned about what will happen to him in prison. (Minghui.org) One day in 2007, I went to the bank to transfer some money. When I handed my ID card to two young staff members, they looked at me again and again while checking my ID and murmured something quietly. I smiled and told the young ladies that the ID photo was taken when I was in my 30s, but I looked like a 50-year-old back then due to poor health. Now I’m nearly 50, but I look like a 30-year-old. The two of them looked envious and wanted to know my secret. I told them that I practice Falun Gong, a cultivation practice of mind and body. They looked even more surprised, as what they had heard from the state-run media was totally different from what they were now seeing with their own eyes. As there was no one waiting to be served, I went on to talk to them, telling them about how Falun Gong teaches people to conduct themselves according to the principles of Truthfulness-Compassion-Forbearance and how the Chinese Communist Party (CCP) has been brutally persecuting Falun Gong practitioners. I also told them about the staged “self-immolation” on Tiananmen Square. They looked appreciative to learn the real story. On another occasion, the owner of a beauty salon asked me which beauty salon I used to look so good. I told her I had never spent a cent on cosmetology, and that I look young because I practice Falun Gong. She was really surprised. Years ago when I was very sick, she had helped me find a doctor for treatment and she knew very well how poor my health was then. I was very sick in 2003 before I started practicing Falun Gong. My stomach and intestines, as well as my uterus, had become dysfunctional, and I also had severe pain in my joints. Doctors advised me to indulge myself with the comforts of life, indicating that my days were numbered. So I started to buy expensive clothes, even though a dress could cost as much as what I earned in a month. But I was only 40 years old and didn’t want my life to end like that. A friend introduced me to practice Falun Gong when she saw my miserable condition. As I also had eye problems, I could not read the newspaper or watch TV, so I didn’t know anything about Falun Gong, nor the persecution of the practice. As I trusted this friend, I started conducting myself according to the principles explained in Falun Gong books. I became a Dafa disciple during the time when the persecution was most severe. Soon, all my illnesses disappeared and I felt light and relaxed all over my body. For the first time in a long time I experienced what it felt like to be healthy. Everyone who knew me learned the truth about Falun Gong through the changes in me and they quit believing the CCP’s slanderous lies about the practice. (Minghui.org) A total of 86 Falun Gong practitioners from Dujiangyan City, Sichuan Province have filed criminal complaints against Jiang Zemin since late May 2015, according to reports compiled by the Minghui website. The practitioners charge the former Chinese dictator with initiating the brutal suppression of Falun Gong and hold him responsible for the tremendous suffering inflicted upon them by his campaign. The criminal complaints were mailed to the Supreme People’s Court and Supreme People’s Procuratorate. Many of these practitioners recounted how Falun Gong returned them to health and gave them a new outlook on life. Their dream to live a healthier and happier life, however, was shattered when Jiang Zemin launched a nationwide campaign to eradicate the practice in 1999. Simply for refusing to give up their belief, they were arrested, detained, tortured, and had their homes ransacked and personal belongings seized by the communist authorities. Many also saw their families implicated for their belief, while some were also forced to pay huge fines. Below, we profile two of the 86 Dujiangyan practitioners who sued Jiang for their sufferings. Ms. Chen Huijun filed a lawsuit against Jiang Zemin on May 11, 2015, charging the former Chinese dictator with launching the persecution of Falun Gong that led to her husband’s poisoning death in 2014. Her husband Mr. Xiao Zhanghe developed unusual symptoms after being given a large amount of tea to drink on the second day of his arrest in 2013. The hospital diagnosed him with drug poisoning, and he died seven months later on his wife’s birthday. He was 60. The local authorities had long deemed Mr. Xiao a target of persecution since Jiang began his attack on Falun Gong. A large group of officers broke into Mr. Xiao’s home on October 21, 2013, and took him to the Tianma Township Brainwashing Center. The police moved Mr. Xiao to the Comprehensive Management Office of the township government the following day. According to his own account, the police brought him lunch. In the afternoon, a female staff came and prepared tea for him. She urged him to have more tea as they talked. At 5 p.m., Mr. Xiao suddenly could not speak and could not focus his mind. In his debilitated state, the police asked him to write statements giving up the practice of Falun Gong, which he mindlessly followed. On the third day, the police continued to give him tea and Mr. Xiao experienced the same symptoms. In such a condition, he signed more statements according to police orders. After signing everything the police wanted, Mr. Xiao was allowed to return home. When he recovered, he returned to the government offices and declared that his previous statements were invalid. He also questioned what kind of drug the police fed him; police denied giving him any drugs. A week later, Mr. Xiao had a sore throat and hoarseness. Large red patches appeared all over his body. The city hospital could not diagnose his condition so his family took him to Huaxi Hospital, which is the most advanced hospital in Sichuan Province. The hospital claimed that the treatment required surgery and it was hard to cure. They also stated that Mr. Xiao would probably die during or after the surgery. The large red patches on Mr. Xiao’s body spread, and he passed away on May 22, 2014. Ms. Li Xia filed her lawsuit against Jiang Zemin on June 9, 2015, holding him responsible for her 444 days of suffering in a labor camp. Because of her refusal to give up her practice of Falun Gong, Ms. Li was subjected to various forms of torture during her detention at Nanmusi Women’s Labor Camp. She was often made to stand for long periods of time, and she was also frequently beaten. In addition, Ms. Li and other detained Falun Gong practitioners were monitored around the clock by drug addicts. During her detention, Ms. Li also witnessed the death of another detained practitioner. According to several eyewitnesses, inmates Xu Wei and Luo Li mixed unknown drugs into Ms. Zheng Youmei’s food before serving it to her. On October 30, 2008, Ms. Zheng just finished washing her hair when she suddenly threw up violently. She twitched her body uncontrollably and began to complain about being cold and heart palpitations. She died two days later, at the age of 61. Ms. Zheng’s death didn’t stop the labor camp from mistreating Falun Gong practitioners. Starting April 2, 2009, the guards ordered more than 50 detained practitioners to eat and work in the same place as 30 plus drug addicts diagnosed with AIDs. As all of them were ordered to use needles and scissors to make toys, they often had cuts on their fingers, leaving Ms. Li and other practitioners in constant fear of catching the frightening disease, which is transmissible through bodily fluid, including blood. Having survived the labor camp ordeal, Ms. Li is now seeking justice not only for herself, but also for people like Ms. Zheng, who perished at the hands of the China’s communist regime. (Minghui.org) Ten Falun Gong practitioners from Shifang City were detained for filing criminal complaints against Jiang Zemin, the former head of the Chinese Communist regime, starting on October 9, 2015. The practitioners were detained at the Shifang City Detention Center for different lengths, ranging from one to two weeks. Officers from the Luoshui Town Police Station went to Ms. Chen Wenying’s home on October 9. The police asked her about her criminal complaints against Jiang. She went with them to the police station where she was detained for five days. Officers from the Jiandi Town Police Station went to Ms. Zhong Qifen’s home on October 13, 2015, to inquire about her complaints against Jiang. The police arrested Ms. Zhong and her husband Mr. Lu Pinggang. Both were detained for 15 days. Officers from the Luoshui Town Police Station arrested 60-year-old Ms. Xiao Kaiqun, a small business owner, on October 15, and detained her for 15 days. Ms. Liu Fengyu, in her 60s, was arrested by officers from the Mazu Town Police Station on October 15. She was detained for five days. Ms. Xu and Ms. Yang from Jiandi Town were arrested on October 15 and detained for five days. Ms. Zhang Qinghui, 50, was arrested by officers from the Yuanshi Town Police Station on October 19. The police ransacked her home and confiscated Falun Gong books, materials, and other personal belongings. She was detained for 15 days. Ms. Wan Gufen, in her 40s, was arrested by officers from the Mazu Town Police Station on October 19, and she was detained for 15 days. Mr. Chen Zhongjun was also arrested and detained. (Minghui.org) I received a phone call from the local police station on September 23, 2015. An officer said that he was calling to verify some information. “Do you want to ask me about suing Jiang?” I asked. He replied yes. I then asked if we could speak over the phone. He said that it would be better if we spoke in person. I agreed to meet with him. “What are you afraid of? He is a traitor for selling out our country,” my husband said. I felt very happy for his support. My husband and I went to the police station around 3:00 p.m. He waited outside as I went upstairs to see the police officer on duty. The officer said, “I’m in charge of this area. I don’t have any intention other than to check some facts.” He requested to see my husband. In 1999, Jiang Zemin, as head of the Chinese Communist Party (CCP), overrode other members of the Politburo Standing Committee and launched the violent suppression of Falun Gong. The persecution has led to the deaths of countless Falun Gong practitioners over the past 16 years. Many have even been killed so that their organs could be sold for transplant operations. More have been tortured for their belief. Jiang Zemin is directly responsible for the inception and continuation of the brutal persecution. Under his personal direction, the Communist regime established an extralegal security organization called the 610 Office on June 10, 1999. 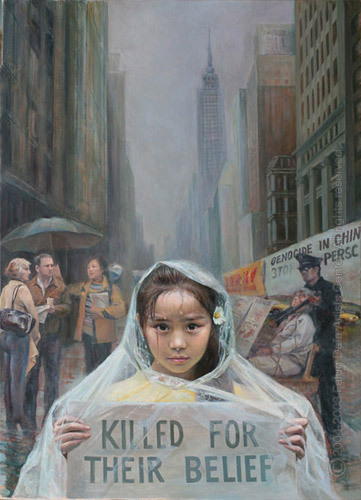 The organization overrides police forces and the judicial system in carrying out Jiang’s directive regarding Falun Gong: to ruin their reputations, cut off their financial resources, and destroy them physically. Jiang stepped down as head of the CCP in 2002, but he has exerted much power from the shadows through a network of officials he put in place. Chinese law allows its citizens to be plaintiffs in criminal cases, and many practitioners are now exercising their legal right to file criminal complaints against the former dictator. (Minghui.org) Ms. Li Guixiang died in late September 2015 while serving three and a half years for practicing and spreading information about Falun Gong, a spiritual practice being persecuted by the Chinese Communist regime. Ms. Li’s daughter received a phone call from Longquanyi Prison around 6 p.m. on September 29, notifying her that her mother was in critical condition. A second call came nine hours later, announcing that Ms. Li had passed away despite emergency rescue. Her family, however, wasn’t given the exact time of her death. Though Ms. Li’s husband, daughter, and son-in-law were allowed to see her body, two relatives were turned away for not being her immediate family members. The guards claimed that Ms. Li died of natural causes and pressured the family to agree to a quick cremation of the body. At the time of writing, Ms. Li’s family has not heard anything further from the prison authorities, who hinted at compensation in exchange for the family’s cooperation. Ms. Li’s imprisonment followed her arrest on October 6, 2013. She was sentenced to three and a half years in June 2014 and soon transferred to Longyuanyi Prison. Her family suspected that she might have been tortured during her imprisonment, as she was only in her early 50’s and had no prior medical conditions. Prior to her latest imprisonment, Ms. Li was twice arrested in 2000, spent three years in a labor camp from 2001 to 2004, and sentenced to three years in 2008, all for refusing to give up her belief in Falun Gong. Each time when Ms. Li was arrested, she was subjected to various forms of abuse. In particular, after she was arrested for the third time in July 2001, she was beaten unconscious. Nanmusi Women’s Labor Camp initially declined to admit her due to her severe injuries, but the camp authorities eventually gave in to the police pressure. The labor camp guards didn’t make Ms. Li’s life any easier, as they tried every means to inflict harm on her. She was once forced to stand for long periods of time without sleep or use of the restroom. The guards didn’t allow her to change her soiled pants. The relentless persecution of Ms. Li drove away her husband, who divorced her around 2004. Later, he re-married her after seeing how she still took great care of his bed-ridden mother even after their divorce. Now that Ms. Li is gone, her family is left to grieve the loss of a loving wife, mother, and daughter-in-law.